As part of a series of talks given in association with the exhibition ‘Eugène Bourdon: From the Classroom to the Battlefield’ celebrating the life and work of Professor Eugène Bourdon, Archives and Collections Project Assistant Fiona Hall delivered a talk on the fundraising activities organised and held by the School during the First World War for various war charities. For those that missed the talk, below is an edited transcript of the talk highlighting the work and discoveries Fiona has made. The Home Front Memorial Project arose as a result of the research and activities surrounding the School’s WWI Roll of Honour project. There are 405 names listed on the Roll of Honour and one of these names is of course Captain, or Professor Eugene Bourdon. If you missed the exhibition about Eugène Bourdon that was on display in the Reid Building, you can read up on the blog posts that tell the story of his creativity and bravery here. 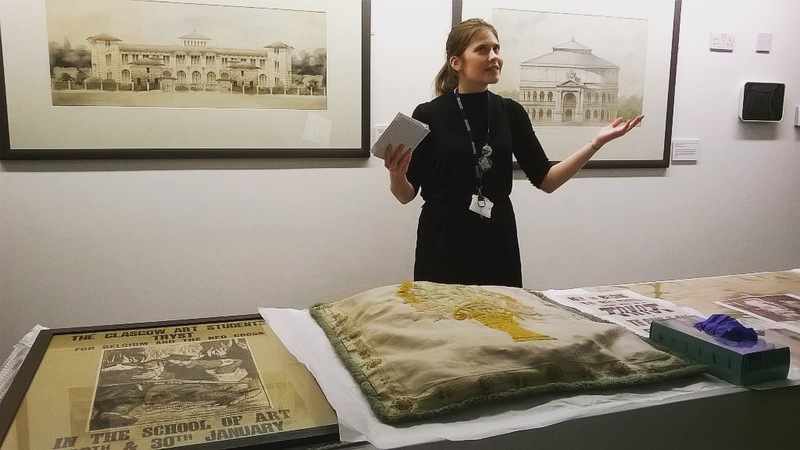 While research into the lives and stories of the individuals on the Roll of Honour was on-going, the Archives and Collections team identified a gap in the knowledge of the School during this period, and realised that little is known about the staff and students that remained behind. The aim of the current Home Front project is therefore to research the names of the remaining staff and students, and to find out why they remained at the School during this period – was it for political or moral beliefs – for example where they conscientious objectors? Or were they not well or fit enough to fight? Or perhaps they remained at the School due to their nationality, or the believed limitation of their gender. This research will go into an online resource documenting the lives and stories of these individuals and I must add that most of the information that I am discussing with you today has relied heavily on material from the archives, in particular two boxes of material relating to fundraising events at the School. 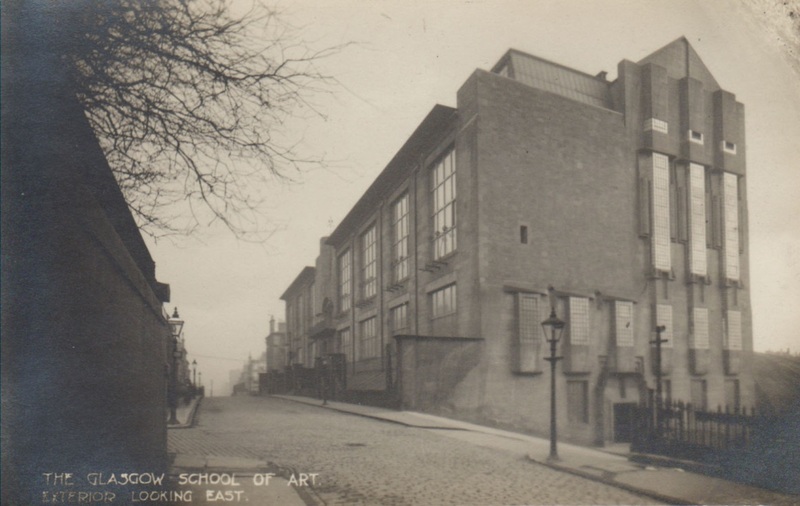 Having moved from the McLellan Galleries into the Mackintosh building in the late 19th century, and with a noticeable increase in student numbers, by the early 1900s, GSA had evolved into a dynamic and flourishing institution. Through its connection with the Glasgow Style art movement, the School had also gained an international reputation. Playing a key role in securing this recognition was Francis Newbery, who was appointed Director of GSA in 1885, and who played an important part in shaping the School’s curriculum. Newbery also encouraged students to think beyond their studies, and to involve themselves in plays and other creative outlets; these sorts of activities featured heavily in the fundraising efforts of the students during the 1914-1918 period. The outbreak of the First World War had a large impact on GSA, as it had on institutions and organisations nationwide. Student figures taken from GSA’s annual reports highlight a significant drop in numbers. For example, for the 1913-14 session, the number of students enrolled was 1,239, but by the 1914-15 session, this had dropped to 873, and by 1916-17, student numbers had reached their lowest point at just 585. Due to a lack of students and some staff members, I believe that some classes were cancelled or postponed. The war also impacted on the School’s curriculum in other ways. For example, military sketching classes were advertised in 1914-15, with the aim of preparing those who would eventually go off to fight. While travelling scholarships to Europe were postponed until after the war, although bursaries and scholarships to other parts of the United Kingdom still continued. As it became clear that the war would not be over by Christmas of 1914, you can imagine the atmosphere of unease, grief and worry that would have permeated the moral of the School. Francis Newbery was greatly impacted by the war and in several of his letters he vocalises this worry. There is a quote from a letter sent by Newbery to a colleague that I want to read out to you, he states ‘only force of will enable ones to carry on art or art education’. From what I have researched so far relating to the Home Front, I believe that the staff and students did indeed have a force of will.